Jackets vs. Penguins: Old friends Jack Johnson, Sidney Crosby meet in playoffs - The Invincible M.A.E. Blue Jackets defenseman Jack Johnson scrolled through his text messages on Saturday after a game at the Florida Panthers, a win that locked the team into a first-round Stanley Cup playoff series against the Pittsburgh Penguins. The first text was from Pittsburgh center Sidney Crosby. For Johnson and Crosby — two friends who met 12 years ago as 10th-graders at Shattuck-St. Mary’s School, a private school in Minnesota — playing against each other in pursuit of the Stanley Cup has seemed almost inevitable since they were drafted No. 1 (Crosby to Pittsburgh) and No. 3 (Johnson to Carolina) in the 2005 NHL draft. 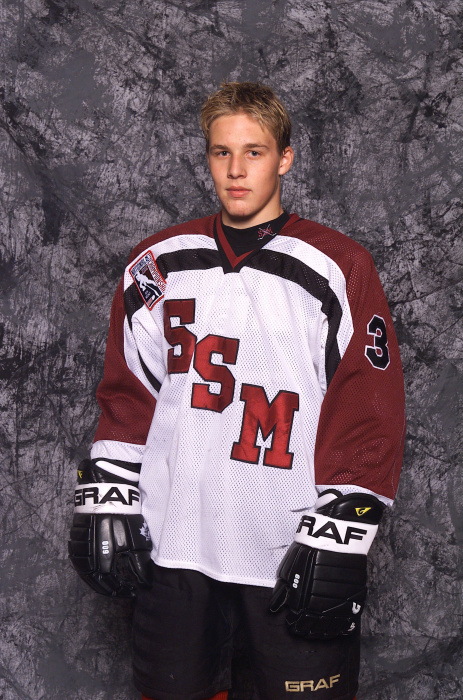 Johnson was in his third year at Shattuck-St. Mary’s when Crosby arrived from Nova Scotia in 2002. By then, he was already a well-known name — the next Gretzky — in hockey circles. They did everything together — eat, study, train, play baseball and fight. In baseball, Johnson played third base and Crosby catcher and pitcher. One opponent on a traveling team from Mankato, Minn., learned a tough lesson about hockey players, even those playing baseball. Johnson was kicked off the baseball team — “so ended my baseball career,” he said — but he and Crosby still joke about it, mostly how the story has reached urban-legend proportions at Shattuck-St. Mary’s, located about 45 miles south of Minneapolis. Johnson doesn’t do much fighting in the NHL, but he has become a physical force for the Blue Jackets. He was 13th in the NHL this season with 24:40 of average ice time. That ice time will almost certainly go up in this series, as Johnson will be a workhorse against the highly skilled Penguins — not just Crosby, but Evgeni Malkin, James Neal, Chris Kunitz, Kris Letang and others. Johnson said he’s expecting a physical series, even when he’s in the corner with his longtime friend. The two have faced each other in the Olympics and the world championships — but never for the Stanley Cup.